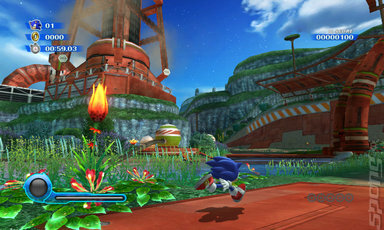 The first thing I noticed when I started playing Sonic Colours is that it was colourful, creative and imaginative. Now, this might seem like really obvious things to note, but put this game alongside most of the Sonic games released in the past decade, and you can see how important this observation really is. Gone are the gloomy greys, the realistic cityscapes and monsters of mass-destruction. In come colourful cliffside beaches, crazy jungle-themed space stations and massive donut rings that you can use as a loop-de-loop. This much visual madness hasn't been seen in a Sonic title since 1993's Sonic CD, in fact, and it's a good thing to see. There is one thing that Sonic Colours has in common with the Mega CD time-travelling platformer, and that's the interplanetary setting. In this game, Sonic (and presumably Tails, because he's been seen in a few of the trailers) visit the home world of the Wisps, a mysterious race of sentient beings that possess remarkable skills. Although Planet Wisp was once a beautiful paradise, Dr. Robotnik (sorry, Eggman) has turned all of that on its head by destroying the landscape and erecting an Intergalactic Amusement Park. He does this by tying together neighbouring planets while imprisoning various Wisps for power supply. Just because he can, really. Who exactly funds this guy to let him get on with this kind of thing, is what I want to know. Can't imagine any sane person giving a rotund manic scientist a business loan for a space casino. But that doesn't matter as he's there now, scaffolding and all, so it's up to Sonic to stop the belligerent dictator from ruining the environment. Sonic franchise boss and Sonic Colours producer, Takashi Iizuka, tells me that this title is not a spinoff, but the next canon entry in the Sonic series, and although he adds that the focus here is “pure speed,” it's clear that he has taken on board how important actual platforming is as well. For a start, the Wii version plays very similarly to Xbox 360 and PlayStation 3 title Sonic Unleashed – the blue blur speeds into the screen along a narrow pathway, as the screen flips from third-person to 2D every so often to provide a little change in pace. Now usually, I'd be apprehensive – a lot of people really enjoyed the daytime stages in Sonic Unleashed, but the emphasis on pure speed and nothing else made the game feel like a Quick Time Event in the guise of a platformer. Luckily for me, playing the Sweet Mountain and Tropical Reservoir planets proved that this was not simply 'Sonic Unleashed 2.' 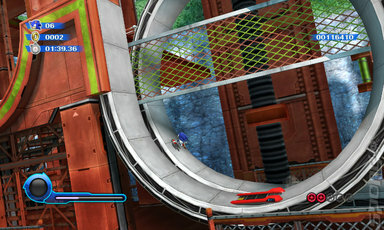 Levels are shorter and sweeter, while the pace and speed of the game has been slowed down immensely. You might think that it's odd that I'd actually want Sonic to slow down, but it's with this new pacing that Sega is able to implement some really nice platforming segments. 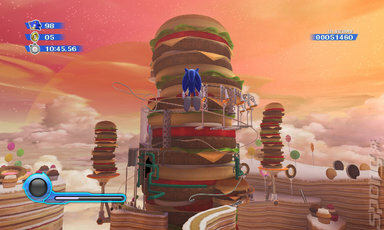 The aforementioned Sweet Mountain is a landscape of food – probably why Eggman wanted to take control of the planet so much – with beefburgers piling up in the horizon and confectionary acting as rudimentary platforms. In a 3D third-person segment, I had to navigate through a corridor by jumping over blocks, whilst ensuring to avoid huge candy rockets that were heading in my general direction. 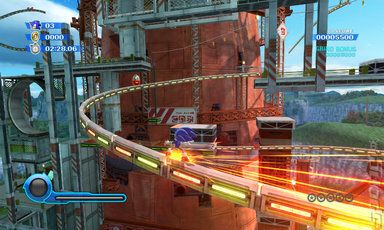 Tropical Reservoir requires an equal amount of platforming prowess, in a setting that fuses tribal themes with an amusement park.